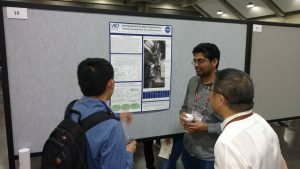 Events Archives - AOSense, Inc.
AOSense was pleased to participate in the American Physical Society (APS) Division of Atomic, Molecular & Optical Physics (DAMOP) meeting from June 5-9, 2017 in Sacramento. We exhibited our ECDLs, Integrated Laser Controllers (ILCs), ILC-Servos, miniature ion pump, atom sources, and miniature optical isolators. We presented a poster, “Development of an Atom Interferometer Gravity Gradiometer for Earth Sciences,” detailing our work funded by and in collaboration with NASA. AOSense President Brent Young discussed Industry Careers in AMO Physics as a panelist. Please see our Careers page for any openings.